Refer a brand new person to BWB for 2015 and instead of a $10 credit on one of your teams, you'll get a FREE team. Tell your friends to sign up and make sure they type in your name on the form. Referral bonus only applies to *paid* teams. If you're giving away a bonus free team to get the person into BWB, you'll get your referral credit if he/she comes back for Year 2 or buys additional teams in 2015. Other restrictions and processes apply - see the rules for details. Player additions (based on 40-man rosters) most likely to show up after the Jan 3 trade deadline. Enhancement to the trade process: When someone accepts a trade, all other open trade requests involving any players in that accepted trade will be automatically cancelled. This should eliminate the situation where the same player is traded to different teams. I'm aware of emails from the game bouncing such as your league broadcasts and/or trade requests (I get a copy of them all). I will be requesting a server change for the website for other reasons to get me off old technology (and more expensive/unsupported). I need to wait until that's done to really dig into the problem. For many domains, the IP address of the mail server where BWB messages come from is on a blocked/spam list. In some cases bounces are due to bad/obsolete owner email addresses. Expanded transaction schedule - cuts and IR moves allowed in Week 26 heading into the playoffs. Some additional comments about the format of the Redistribution Draft - we're still doing three picks per round and my belief is that it does what it's intended to do..."redistribute"
Team payment information - you can find a link on your team roster page, but here's a direct link to your financial summary. Most teams have a $5 early payment discount through Dec. 13. First new 2015 Rule Change - We'll post the Redistribution Draft one round at a time - teams will have the chance to change the remainder of their list in between rounds. Additional comment coming soon on the Redistribution Draft. Meanwhile, I've reviewed the comments on the blog for other suggested rule changes and over the next week or two will make some decisions and post any resulting changes. Here's a list of: Things to know about the postseason - and prepping for 2015. First step before you can do any trading or pick your carryover players - indicate if you're keeping each of your teams in 2015. You must answer "yes" before you may submit any trades or before anyone can contact you for trades. Deadline is January 3 or we assume the unanswered teams become Orphans. There's a $5 increase in team fees / the multiteam discount however increased from $10 to $20. Pay before Dec 14 at 3AM Eastern - and you'll offset that $5 increase with an early payment discount. League packages are at 2014 prices until then. Teams with league championships and other post-season tournament winners have free bonus teams to use. See the list of new leagues coming in 2015. You can also pick up new teams for 2015. Trades are now open - you have until December 13 for the first trade session. The second session will extend through Jan 3. You can also begin choosing your carry over players - visit your team roster(s) for a link to do that. Final deadline is January 11. There may be some pages that don't yet work or haven't been fully switched to 2015. Be patient - I'll get those working soon. Let me know if you find anything. Rosters reopened....Trades available with the next trade deadline as Saturday, Dec 13 at midnight Pacific. Look for postings on rule changes over the next 2-3 weeks. Positions updated for 2015 - these are final, except for where you see an "x" in the position - these players are not yet verified (and some may be removed from the game for 2015). Salary cap - The 2015 cap is 37328 - very close to 2014's 37400. Teams have been given their 2015 cap cash (the actual distribution is enough to get the team in your league with the smallest cash balance up to the cap level). Post season cash awards for playoffs and Players of the Year are still to be awarded. 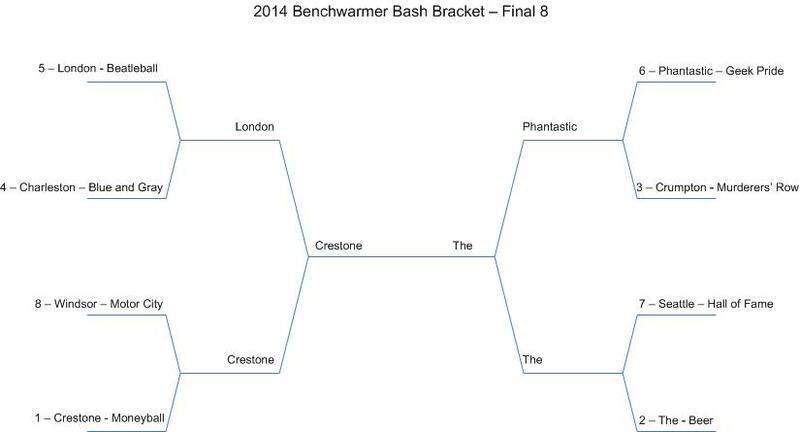 Both owners have won the Bash previously with different teams - Kevin in 2013 and Jesse in 2012 and 2011. Final Result: Crestone defeated The 4-3; Congratulations Kevin! Game 7 scored and posted...we're done! For anyone still alive with a chance to be in the Benchwarmer Bash. Playoff lineups can be reset again one more time that will cover all weeks of the Bash. Lineups are due Friday night, Oct 31 at 11:59 PM EDT. 2014 Benchwarmer Playoffs - Bottom Feeder quarterfinals are complete - we move on to the semifinal round during games 4-6 this week. In prep for the playoffs we need to resolve any ties for 2nd or 3rd place to figure out who goes to the Gore Cup and how reward money for division placement is distributed. I am back! A few hiccups on travel Friday/Saturday pushed back my plans to get caught up...look for the playoffs brackets to be set up in the next few days, and my hope is to begin scoring the first round of games by Wednesday (maybe Thursday). The overall goal will be to finish off the league championships by about the end of the World Series. Meanwhile - since I don't need them yet, I'll reopen lineup changes for the first week of the playoffs until Wednesday at 7 PM Eastern. So - now comes the break in the schedule that I referred to last winter/spring. Regular season is complete, but I'm on a trip for the next two weeks - we'll do the playoffs when I return. Playoff lineups are due Saturday, October 11 - 3 PM Eastern. Topics include: Trade deadline, Are "cash only" trades good or bad?, Dealing with lineup construction and bench usage or who should be considered for the starting lineup, Startup Draft, Redistribution Draft. No changes coming soon - probably not until November - but your input now and during the next few weeks will be valuable. Major won 4 of 6 in the final three weeks. Everglades won 4 of 6 in the final three weeks. Venice Beach won 4 of 6 in the final three weeks. South America won 4 of 6 in the final three weeks. Utopia won 4 of 6 in the final two weeks. Hampton won 4 of 6 in the final three weeks. 6 games left in the regular season - still over half the divisions (84 out of 164) are not yet decided. Subtract 5 from the MLB game # to determine how many BWB games can be scored. Yeah, there are enough MLB games to finish off the week, but I'm running out of time today. Next update expected Thursday night. Repeat of note from 8/25 below: See some additional explanation of how this rule really works - it's not exactly like an extension of your bench. Added today to this link are some additional notes from 2013 on how bench spots are filled and the "callups" are used. It doesn't count yet - we're setting lineups now for Week 22, but I've turned on the option to let you set the order of your minor league guys a little early. See some additional explanation of how this rule really works - it's not exactly like an extension of your bench. If you still have Brady Aiken on your roster, he's going to be removed from the player list after the season as an unsigned draft pick...might as well drop him. No changes coming soon - probably not until October - but your input now and during the next few weeks of August and September will be valuable. Thanks to new people in the game each year that dig into the rules and find problems/inconsistencies. Here's another correction in the scoring formula - not a rule change or game-scoring change, but something left out of the batting score formula when converting from spreadsheets & computer code to the text of the rulebook. At Game 100, we reached the 2/3 mark of the regular season. This is a cost-saving move - paying a cheaper price for a player now than he will be next season. You do NOT have to do this in order to keep the player for 2015. You do NOT have to spend the money now or lose it. You'll keep any leftover cash throughout the winter for paying 2015 salaries and signing free agents. Teams already received their July cash disbursement of 1 million bucks - so the cash you have is what you have available for this week's final shot at contract extensions (plus any salary rebates from trades this week and cash you get based on Week 16 games). I've been alerted to a problem with receiving emails related to trades and broadcast messages from other users - particularly if your email address is Yahoo, AOL, Gmail and some others. You can look up DMARC for the technical details, but this will mean that I need to redo how BWB generates emails between team owners. In the meantime, if you think you are not receiving trade offers, don't forget that you can see all of your pending transactions across all teams - including pending trade decisions. This works even if you have only one team. Here's a new page: Around BWB. This will show of recap of the best and worst among the 41 leagues in operation this summer. Currently it shows the teams with the best and worst records in the system - but look for additional categories in the next month or two. As with the signs/drops, there's no more intermediate page after making lineup changes - you'll go right back to the lineup change form in case you have more adjustments. On the all my rosters and all my transactions pages, instead of just switching only to the team roster, you have choices to go directly to your lineup change form and transaction page. You have 2 more weeks to get salary rebates for cut players - Week 15 (deadline Friday 7/11) is the last chance to cut a player and get money back on his salary. Contract extensions - Week 18 (July 31) is the final chance to do contract extensions this season. Hopefully a beneficial change with some page modifications - there's no longer an intermediate processing page for adds/cuts - you'll go right back to your transaction index. For those of you with multiple teams this should greatly decrease the number of clicks and page loads you need each week for your transactions! First round draft picks - one point of warning. If the players do not sign a contract, they are removed from the game (you don't get to keep them for the next draft). First round draft picks are now included in the player list (use the selection filters on the player list/free agent pages to find them). Let's do this...Weekly transactions/lineups due at the first MLB regularly scheduled game time of the day. Available for signing during Week 12 - deadline Friday, June 20 at noon Eastern. All teams received an extra million in cash during next week's transaction processing. Next cash distribution is Week 13 (deadline June 27). New page - if you have multiple teams, this shows you a transaction results recap for all your teams. Reminder - every 5 weeks our transaction/lineup deadline date shifts to match up with MLB games. Starting this week transactions and lineups are due every SATURDAY at Noon Eastern. There have been some questions about the "saves" part of the score in game scoring. I think I translated program code to written rules incorrectly a couple of years ago - I will try to clarify that this weekend. Reminder as you set your lineups from one week to the next about the effect of moving starting pitchers around (to avoid playing around with the rotation spots and previously-known performances). If you move a pitcher from a spot starter, taxi squad, or minor league slot into the starting 1-5 rotation, all previous starts are ignored - even if queued in the spot role - and no starts will count until the deadline date of the transaction week. Exception - pitchers signed or acquired via trade one week earlier can be assumed to have been obtained for purposes of immediate use and any eligible starts will be used if they are placed in the rotation. In a 2014 rule change to relax this a bit (and allow for dealing with injuries more quickly) - if you move a pitcher from the minors or taxi squad to a spot starter role, any eligible starts may be used and won't be thrown out if before the deadline. See the rule change and the full rule. BWB 2014 Schedule Posted. How to find this on a regular basis? On your league's home page, find the link "This Week's Games"
On any page, down in the footer, find the link "Results"
To find new players, on the free agent list, choose the proper week number that players are first eligible for signing - with this group, you'll find them via "Week 2"
We use batting stats 5 games ahead of our BWB game # in order to queue up enough pitching stats, so a team's MLB game #6 is used for BWB game #1. Weather permitting, Detroit will be the last team to get to Game 6 - on Tuesday (thanks to a rainout already) - and that makes Wednesday the earliest we can post a game. Usually it's more time-effective to score 2-3 games at a time, but often doing a single game first helps me clear the cobwebs on how to do this again for the first time since Sept/Oct...so look for a game on Wednesday night. We still have plenty of orphan teams available. Contact us to get set up with one. It's Week Zero Transactions: Deadline has been changed to 7 PM Eastern on Monday. Check out the schedule/deadline page for some planning about what you need to do for Week Zero and Week One. Lineups are due Week 1 (April 6), but there's a one-week lag between picking up a player and using him. So if you need to fill spots for Opening Day, you need to pick them up by March 31. Also - don't forget that for returning leagues, your cash balance must be at 5000 or lower at Week Zero. Silver Screen League Draft. See the Silver Screen Draft Index for updates. Phase Two Draft, Part Two complete. Rosters and finances updated. It's a quick turnaround, but Silver Screen is now eligible for Week Zero transactions, including cuts, trades, and free agent signings. Deadline is Monday at 5 PM EDT. Payment is due soon. Check your status - team fees for 2014 are due by Week 1. This is fantasy baseball 365 days a year. Teams are now completing their rosters for the 2014 season. We're not drafting any more new leagues in 2014. But, if you'd like to attempt to turn around a struggling team, these orphan teams are available...pick up an existing team and rebuild it, rather than start from scratch. Orphan teams are just $35 - about 1/2 the normal price. If you're interested, your first step is to sign up here. Then check out the orphan list again and send us your choice. There are still a couple of invite-only orphans in private pay leagues - Beer League and Moneyball - that are available. There's an extra entry fee by the league owner and they pay out prizes (BWB standard leagues do not pay out except in free teams and discounts for next year). Do you have multiple teams? Are you looking for a way to figure out if your teams have been hit by the injury trend - and what rosters might hold Medlen, Beachy, Corbin, Iglesias, Chapman, et. al.? Don't forget that there is a page that shows all players on all your teams - and from that you can see which teams have a particular player. New leagues for 2014 ignore this - but everyone else - don't forget that you need to have your team's cash balance at or below 5000 after Week Zero transactions (March 31 deadline). See the rule. One way to get your cash to 5000 or lower - sign players, trade for more expensive players, or give up cash in trades. Another way is to sign players to multiyear contracts (be careful with this so early in the season...don't overdo it). Thinking ahead: Sunday at Noon is the deadline for Week minus One transactions. Check out the schedule/deadline page for some planning about what you need to do for Week Zero and Week One. Lineups are due Week 1, but there's a one-week lag between picking up a player and using him. So if you need to fill spots for Opening Day, you need to pick them up by March 31. North Siders League Phase Two Draft, Part Three posted - see North Siders Draft Index - That's it for the draft - you're done. We start off with weekly transactions with deadline next Sunday. Steel City League Phase Two Draft, Part Four posted - see Steel City Draft Index - That ends the draft process...and you're off to trades and free agency beginning with this week's transaction deadline of Sunday, March 9. Contract extensions are now open. The strong suggestion is unless you need to get your cash balance to 5000 or below by March 31 that there is no rush and great risk to do these now. You have until the end of July to complete multiyear contracts. Anchorman League Phase Two Draft, Part Three, results posted - see Anchorman Draft Index Draft is complete! League now enters weekly transaction cycle (starting this week - deadline Sunday). Free agency and trades are open. This week's deadline is Sunday, Feb 23 at Noon EST. Transaction order for this week is the same as for the Redistribution Draft. Special posting of Week -7 Transactions - This is a pre-Redistribution Draft cut of retired players from the rosters. Players that officially retire before the start of the season are removed with a 100% salary rebate (unless previously signed to a multiyear contract, then there is no rebate). The Redistribution Draft is extended to allow me time to finish off the orphan teams. You have a couple more days to make your selections (see the link on your team roster). Deadline is Tuesday 2/11/14 Noon EST. The 2014 Redistribution Draft is now open. You have 2 weeks to make your selections (see the link on your team roster). Deadline is Sunday 2/9/14 Noon EST. There are a few open spots in some private "prize" leagues - they require an extra entry fee but the leagues pay out prizes. Check out the list of orphans and under the invitation leagues you can check out the teams for Beer League, Murderers' Row, and Moneyball League. If interested, you can email me and I'll get you in touch with the league owners. Deadline shift - Carryover selections - Sunday, Jan 26 noon EST. Meanwhile here's a reminder about the carryover process in the postseason information page and the BWB Rules.